It’s December so I think it’s acceptable to start doing some Christmas baking. I always start thinking about what I want to bake for Christmas months in advance and then come up with a list way too long and completely unachievable. I’ve tried to be a bit more realistic this year but it still feels like there’s a lot to fit in in a short time! In the past I’ve made Christmas puddings (several times! 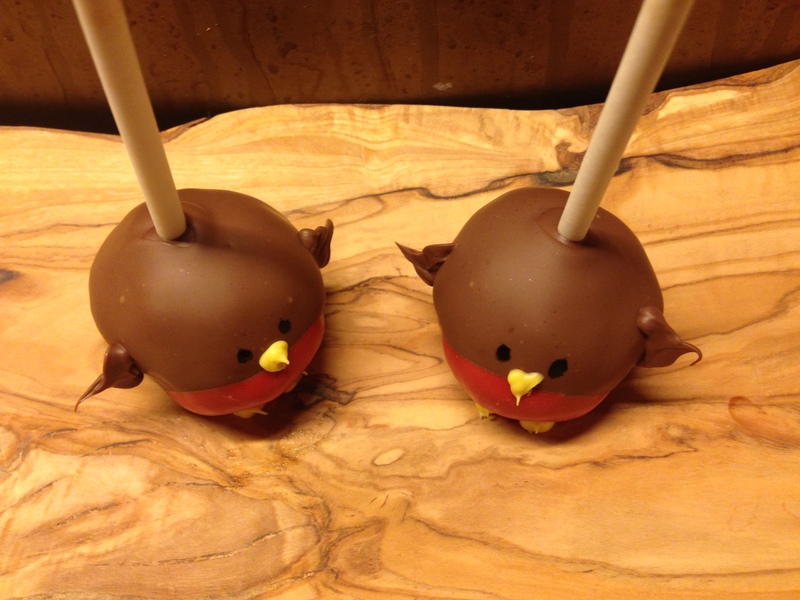 ), reindeer and snowmen cake pops. However I like trying new things so I decided to give some robin a go. I attempted to make them on Sunday but ran out of time so I finished them off last night. Due to my attempted rush to make them on Sunday they weren’t as round/smooth as ones I’ve made in the past – it definitely helps if you spend the extra time making sure they are really smooth. I started off by making a batch of brownies, leaving them to cool and then mixing the whole lot together in a bowl (so the squidgy middle and slightly drier edges are all combined). I then rolled it into balls and put them in the fridge to harder. I made these quite big – about the size of a golf ball – so I got 40 out of one batch of brownies. I melted around 400g of milk chocolate – you won’t need it all, but it’s much easier to dip the cake pops in if it’s deep (I usually pour the left over onto a silicon sheet and then break it into chunks when it’s set to use in chocolate chip cookies or muffins). Dip the end of a cake pop stick into the melted chocolate and then stick into the middle of one of the cake pops – push it in so it’s about half way into the ball. Leave the sticks to set in the cake pops in the fridge. Once they are set, take a cake pop at a time and dip into the melted chocolate so that it covers the whole ball. Gently tap it on the side of the bowl to knock off any excess chocolate and then place on a silicon sheet in the fridge to set. Once the milk chocolate has set, melt some red candy melts (add some white vegetable fat to thin it down if they are too thick. 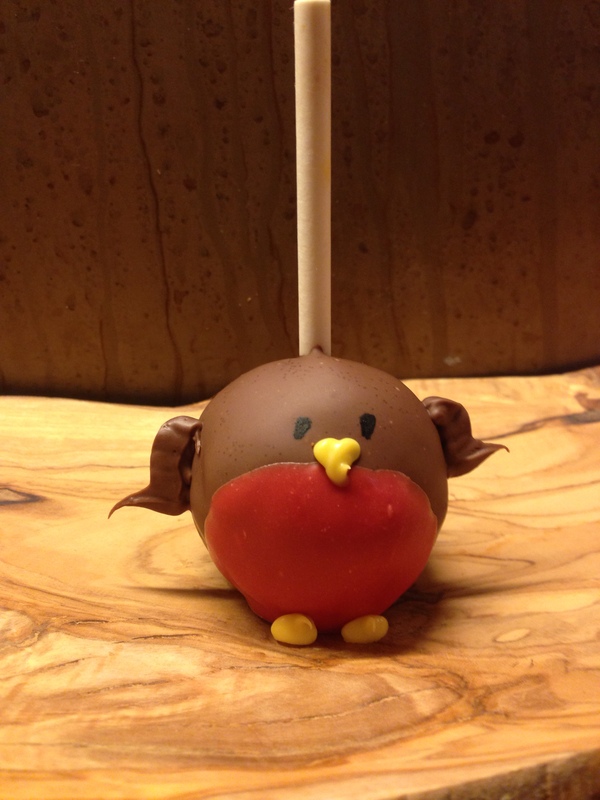 Hold the cake pop at a 45 degree angle and dip into the candy melts to make the red breast. Leave to set. Melt some yellow candy melts and place into a piping bag with a small plain nozzle (I used a Wilton no. 2) attached. Pipe a triangle on for the beaks and a couple of bits for the feet. Using some black food colouring paste paint 2 dots on for the eyes. By now, the milk chocolate should have thickened but still be runny enough to put in a piping bag ( used a leaf nozzle ) – fill a piping bag and pipe a wing onto each side. Keep an eye out for more festive baking ideas coming up later this week….